Dogtown is a fun and safe place for your dog to play while you are at work, out of town, or out doing your everyday activities. We believe the key ingredients to making a happy dog are EXERCISE and SOCIALIZATION! We offer supervised cage-free group play in downtown Lexington and our indoor and outdoor play areas (with GRASS and MULCH, not concrete!) allow your dog to run and play with friends all days! Boarding at Dogtown means your dog won’t be locked in a kennel all day! All dogs welcome… big and small, young and old. 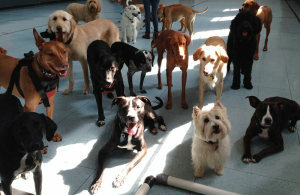 Dogtown was voted Best Doggy Daycare in Ace Weekly’s Best of Lex 2008 and 2009! We were also awarded the 2008 Smiley Pete Award! Birthday celebrations are no extra cost at Dogtown. Customers may provide their own cake or treats if they want, but it is not necessary to bring anything at all. 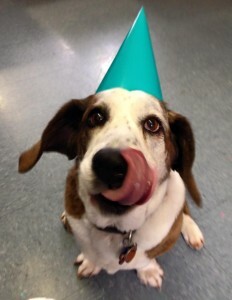 We take a picture of the birthday pup and post to Facebook and our site.